Are you a fan of shimmering stretchy pants, bedazzled sweaters and like to shake your booty? 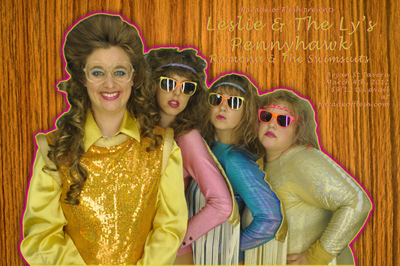 Ames, IA based rapper/mc LESLIE HALL, who fronts LESLIE & The LY’S will bring their all-female party train through Dallas with PENNYHAWK and RAMONA & The SWIMSUITS at the beginning of March. Leslie & The Ly’s have a new album Destination Friendship out now, listen at their bandcamp. This entry was posted on March 2, 2012 at 8:30 am, filed under News.